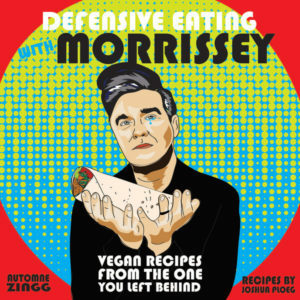 These books started out as zines by Automne Zingg (if you like her project video, you’ll love her video performances as Lacey Spacecake, featuring her illustrations of sad Nick Cave and bummed Morrissey using food to make themselves feel better. 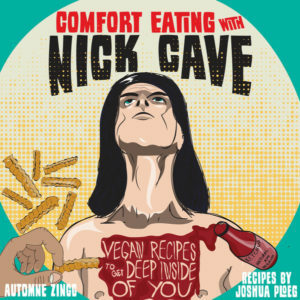 We asked vegan chef and queercore chanteur Joshua Ploeg to pen recipes to go with each illustration in the book. He put the back catalogs of first Nick Cave and then Morrissey on his kitchen radio and whipped up some lyrically inspired and laugh-til-you-cry delights. The result of this magic combo? Two crass, classy, and delightful hardcover books that’ll help get you through the hardest and hungriest times of your life. They come out in October; back the Kickstarter and you’ll get them earlier. Back for a little more and you’ll get a pile of other books of music, comix, and/or vegan food — or a bit more than that, and Automne will write you a song or draw a custom portrait of YOU eating your favorite food. Or perhaps Joshua will come to your town and cook you a meal!